Independent Pattern designers – of whom there are many these days – do not have the luxury of a professional pattern testing team. They cannot afford to pay people to make up several versions of their designs. So they often seek others – family and friends, or keen amateurs they contact through the internet, to make up a version of their design and give feedback about what works and what doesn’t. The designer can then amend the design and directions to make them better. – provide all above services for free? I think it would be fun to pattern test, mostly because I’ve never done it. I’m long since past the “needing to sew” stage–for many years it’s been the “wanting to sew” stage for the experience, the creativity, and the fun it brings. I would hope that no matter what I would learn something new from the experience. I am firmly in the latter camp. I joined in for fun, and for the experience. That said I knew something about the designer, Lauren Dhal. In fact I had done one of her courses (which was not that good to be honest). 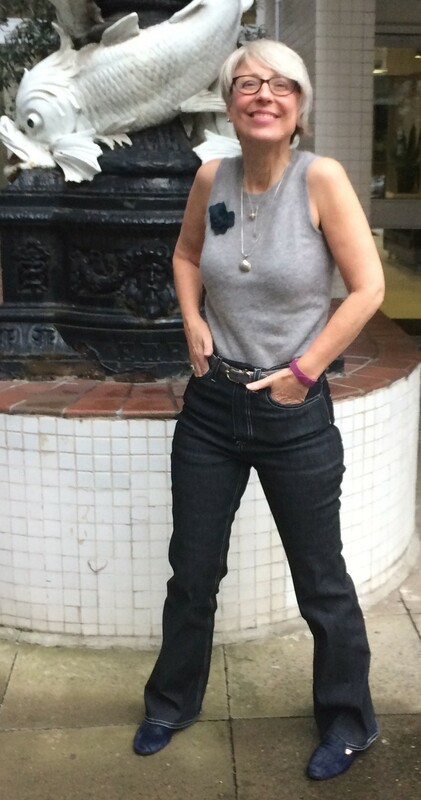 When she posted her Inspired by Jane Birkin jeans on Instagram I really liked the look of them. I asked myself – is this a pattern you might buy? And I said yes, so I thought why not? I get the pattern free and I will learn about how a designer reacts to test results. I am not a professional seamstress so I would not expect to be paid for this. I see it as a way of helping someone who is designing but without a whole studio of testers and professionals at their disposal. My experience has been entirely positive and I wanted to give this feedback in case others are wondering if it is a good thing, or something essentially exploitative and cheeky. There are a few cynics in the sewing community who notice hundreds of, shall we say “Poppinjay Pants”, appearing on blogs and Instagram, with comments such as “Awesome!!! !” and “Beyond Brilliant – Wowsers!”. They see a rather banal or poor design (RRP £12 or more) being “tested” by young, impressionable “sewists” who then marvel about the outfit on their glorious, colourful, glossy blogs. And then they react against “blog tours”, “sewalongs” and pattern-testing-as-marketing. So I wanted to tell you like it is. I volunteered because I liked the design. Lauren set up a Facebook group so the two dozen testers could share questions, views and pictures. She responded quickly and decisively to every issue that was raised. She took the criticisms to heart and redrafted parts of the pattern. She revised the instructions as people said that parts were difficult to follow. She was not at all precious about testers making changes to her design (I narrowed the flares a little). It was a learning process for her and she was keen to take advice from experienced seamstresses. She did this while leading a busy life with three kids etc, with humour and gratitude. She did ask people not to blog or publicise problems but to let her work through them. Entirely reasonably. She did ask testers to model their jeans and use Instagram or other means to publicise her pattern. But this was a low key request. I felt inclined to publicise the pattern because I liked it, and I would say other testers did too. So if you want this pattern here is the link. I believe there will be a sew-along too. You’ve pretty much convinced me to try out this jeans pattern at some point if I don’t have an equivalent in one of my magazines. I especially like the high rise, which is my go-to jeans look. Re. the point of the post: I don’t see any issue with pattern testing, as long as people know and accept what they are getting into. As I’ve mentioned before, I don’t relate to the irritation that people feel in regard to independent designers, as I think to each his or her own. It’s true that many are not very skilled and market themselves otherwise, but anyone can enter the market, i.e. it’s an invitation for highly-skilled people to jump in and show how it’s done Eventually the wheat will separate from the chaff anyway, as consumers become more knowledgeable and learn more about their true preferences (markets have a way of sorting themselves out in that way :)). Good for you that you got a nice pair of jeans out of it and felt that you were helping out someone trying to make an honest living. I do a little bit of pattern testing when it suits me, but only if I really like the pattern and would wear it, if I like the designer, if they have what I consider to be a realistic schedule, and if I don’t feel pressured to blog about the garment (although I usually will if I have been happy with the finished product and the testing process). No-one is forcing others to participate in pattern testing – it is a choice! However, I do appreciate it when I feel that the person who has designed the pattern really does appreciate the work that testers do, and that they take on the feedback they are given and make changes accordingly – before the pattern is released! I find it quite a bit of fun to be part of the process, as long as it is on my terms. And I DO love those Birkin flares on you! I can’t help but wonder if your hypothetical person A, the tester who won’t, isn’t speaking from a context of a growing demand that people volunteer their services in all sorts of different fields. I’m thinking for example of “interns” at prestigious and profitable magazines, who are not paid on the grounds that they’re still learning and ought to feel honoured just to be allowed in the door. If people are making a profit, they should share some of it with everyone who assists them in making it. That should be the bottom line. But if newish independant designers are not making any money to speak of, and can provide a fun, interactive learning environment for volunteer testers, I think everybody wins. I’d love to be asked to be a pattern tester, but I would need to be as happy with the pattern and designer as you were with this one, before I would jump in. I’m a GOMI snark myself, and have particular pet hates about some of these ‘designers’ whose wares are clogging up the internet…so I avoid them and mutter darkly when their fangirls squeal about the wonderful [frumpy/childish/ripped off] clothes they’ve made. Up to them, horses for courses. Volunteer pattern testing is a good thing, as long as the write up is brutally honest. That’s for the benefit of both designer and potential consumer of course! Anybody want me? Hmmm? Short, stout, middle aged snarky pattern tester available to a good home…. I have volunteered to test once before – a machine-knit cardigan, which I still wear regularly, although I was too slow making it to offer useful feedback. (Although in fact, it was a good pattern). I do think people have to make up their own minds, as to whether it works for them. Your jeans look great, and your experience in sewing and fitting were surely an asset as a tester. I understand that sewing is your hobby and most people don’t take up a hobby with the intention of earning money. However I do feel uncomfortable with how alot of indie designers work, (and earn money) by asking people to work for free. I come from an artistic background, currently studying to re-skill. I’m back in college in the hope of future employment where I’m paid properly for my work and my time. Once people know you have creative abilities, they have no issue with asking you to work for nothing or else very little. I feel people often undervalue creative ability, and the idea of asking people to do unpaid work to help the pattern seller earn a living is often just another example of this. Like everything in life it’s a matter of perspective! In this instance, you are happy with the outcome and have a great fitting pair of jeans to show for it! My view on pimping for patterns is well known. Of the hundreds of non-professional pattern testers and bloggers raving and pushing a new patterns by an indie person, very few have a decent result. Testers who have little knowledge of grading or good fit end up working for the price of the “free” pattern (normally way more than we would pay in a fabric store) in exchange for a fabulous write-up and photos. If you are invited to “test” a free meal at a new restaurant and agree to dress up, take photos of yourself wolfing down pasta and wine and spend the money to drive there, give up your evening, pay for parking in exchange for an “unbiased” review…are you going to write a poor one? I can understand working for a friend to promote her new business, I really can, but the sewing blog world seems so saturated with this practice and it encourages the phenomenon of “fan girls” which is not a complementary term these days. You are very lucky that these pants turned out so well and I’m happy for you that all the time and energy and cost of fabric and supplies was worth it. It sounds like you met some new friends along the way too so it is a win/win! I have pattern tested on one occasion. I do sew for profit – but for that time I was happy just to try out (and assist) an independent who was producing innovative patterns and appeared to have a grasp of the craft. I enjoyed the experience, and hope I was able to offer constructive criticism where needed. In truth the pattern was so well drawn and came with good instructions so I wasn’t able to say a lot! I understand person A being perhaps reluctant. There seems to be an increasing number of ‘wannabees’ on the internet who have read a pattern cutting book, turned out a basic pattern, and now call themselves a designer. They will vanish pretty quickly. What is pattern testing? A random group of home dressmakers can certainly give feedback on pattern instructions. Problems with inaccurate drafting should have been picked up in the original draft. Fit problems can’t be shown up this way because a pattern has to be drafted to a set of measurements, a hypothetical ‘norm’, and each tester will be a different size and shape. It seems like a marketing exercise to me, but if participants are happy with the arrangements, what’s the harm? Like the jeans on you btw, and especially appreciate that you documented the hem changes. In this case we gave feedback on the instructions but many of us had an issue with the waistband so Lauren redesigned it. Also the hip to waist ratio was changed slightly to fit more snuggly at CB. I think this helped her get a better “average” fit. I’ve done testing for established pattern companies in my past. I was paid for the effort, which was a non-trivial undertaking. Not only did I make the muslin (and send it to the designer), but I also marked it up, reviewed the instructions and provided extensive documentation on my work and suggestions I had for improvement. Since then, I’ve been asked by some “indies” to test their patterns. I always quote my rate for testing and feedback. The responses I have received have ranged from “Thanks but no thanks” to a shocked, “Oh, but this is to help me get my pattern line off the ground. You get a free pattern and lots of publicity on my blog!” I politely decline. I have no beef with anyone who wants to do volunteer pattern testing. I’m sure in some cases I would do it, if a good friend asked, for instance. Your jeans look very nice, and the other versions I’ve seen also look good, so hopefully this pattern will be a bestseller. Thank you for a nicely balanced point of view. I think one’s reaction depends on one’s situation. For me sewing and blogging is a hobby – I make a living doing something entirely different! I do pattern test, and now and then come up with a finished result worth writing about. I like to see what people are doing, and if I have the time between gigs, I do it. It’s a world of networking and exposure development. I used to get paid to write, back when newspapers existed and writing was paid for. I will spare you my editorial on how and why things have changed. They have. Here we are, writing this copy for free. Your jeans look great on you, a really nice fit. I’ve read about a middle road on some blogs, where the designer sends the fabric (and possibly some notions) as well as the pattern, which seems a fairer compromise when they want to benefit from skilled makers’ input. I am the ‘hypothetical’ person A mentioned in this post, but was only parially quoted. The company asking for pattern testers only signed up at the Stitcher’s Guild to get pattern testers, no contribution, no participation, etc. I also said in my post there, that if an active member, whom I familiar with, would ask me to test a pattern, I would agree if time and logistics worked out for me. I’m firmly in the same camp with Mrs Mole and Gorgeous Things when it comes to pattern testing, especially since I had worked in the fashion industry for 20+ years and one of my responsibilities was to ensure the fit of each collection is what our target customer expected and to write detailed instructions to the factories. Thanks for the clarification M. You have a very legitimate viewpoint, and one that influenced my thinking. Of course the reality is always more nuanced. I have happily tested a few patterns for free, but only if a) I really liked the pattern and considered it something I would want to make anyway and b) I trusted the designer to be someone who generally produced high quality patterns. I do it on the basis of being an experienced home sewer who can spot the odd typo not a industry professional (I would expect feedback of that kind to be paid for). I give my honest feedback to the designer and will happily post photos of the finished product on my blog if I like it. When I post these projects try not to do so in the form of a review as I agree that I don’t think I could review something I got for free very well. I can definitely see both sides. I think the concept of pattern testing is a very good business model for the entrepreneur and if they can find someone willing to do it, who can blame them? From their perspective, however, I’d want to make sure I was choosing testers who would be willing to give me constructive feedback, and not just pick testers based on their ability to blog frequently and blow sunshine LOL. From the tester perspective, I’d want to know that if I did provide feedback, I’d be respected and listened to. (I’ve heard of “designers” who have responded to such feedback in appalling ways). Without both parties treating the system like a serious business, it’s all too easy to end up with a bunch of flimsy, fangirl “reviews” that get a lot of “likes” and comments, but aren’t doing anyone any good. I personally would test patterns for a designer whose patterns I have sewn/knit from before, whom I know drafts and designs competently, and whom I genuinely respect and trust to take my feedback seriously, because it’s very likely I would purchase and sew/knit that pattern anyway. What a sensible and balanced view. I should have got you to write the post Amanda. Interesting to read your perspective. I have a background in knit design and publishing. There the debate has been heated for a long time as to pattern testers and sample makers. Those are two different roles. The sample maker makes a single version in colors for the magazine, in measurements to fit their intended model (or intended sized model). Often time, the sample maker receives a nominal contribution – maybe $100 – and is provided the yarn. But, the pattern tester doesn’t really exist in publishing. The crazy reality is that only independent designers use them. The big mass market designers don’t. They have a pattern block they design to. And they run it through “technical editors” who “see” the issues on paper not in the actual garment, and make changes based on their expertise. I see both methods (that of the independent and that of the mass market) inherently flawed. The independent can only afford to offer their wares at high quality when they have an army of willing volunteers. The mass market will surely miss major issues, maybe ones that only affect a certain size when scaled, but they can undercut the independent and have channels to sell many more copies of their wares. The expenses of the big company are very real still. And while some independent designers do the work as their job – and pay the bills with their efforts, others use it as a side business or have financial support elsewhere so that their business is really only supplemental to their income. Huge differences in how they structure the business financials and what makes sense for them. Yet, all these players meet in the same market to sell their wares. One very big, complicated, situation – that I find completely fascinating. The real debate only begins with these observations, then comes in all the questions of valuing time and art, and who determines a living wage and who gets to demand one. etc etc. Thank you for a most interesting and enlightening comment. That was nice. I like your attitude towards the designer, and the process. I’m sure it helped that she took criticism as it was meant, and not personally.